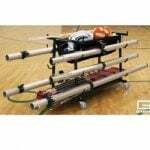 HiTech Sports has developed the Wedgelock sleeve system which eliminates post wobble when the post or ring is hit by the ball or players. The innovative aluminium system is also available to suit every level. The Aluline range is available in either fixed senior height or height adjustable for junior players. 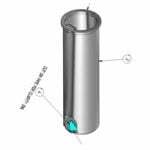 Posts are our exclusive custom designed aluminium “Aluline” post extrusion. Much stronger than larger steel pipe due to our internal reinforcement design. Much stronger than steel and much lighter. 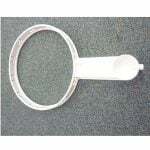 Innovative and HiTech modern extra heavy-duty ring with milled net holders. 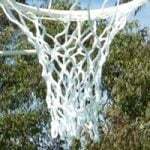 No net ties to break off and cause injuries or support struts. Plastic end caps on the bottom of the posts to protect the sports surface. 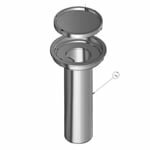 Powder coated pearl white finish for clear visibility on the post base and powder coated red on the sliding collar to indicate it is a variable height system. Safety sliding design allowing for Netta height so variable from 2400mm to 3050mm or anywhere in between. Minimum height set so cannot come down to low. 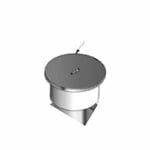 Base plate to attach directly to the concrete floor or to a temporary sports floor as used in major Arenas on portable floors or modified for special use such as beach/sand netball or tee bases. 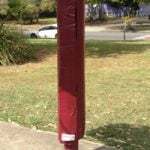 Both Aluline posts have particular type of sleeves to suit the Wedgelock system and the sports floor type from Pulastic to timber to outdoor. 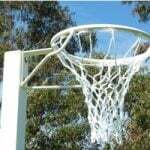 We also supply rings, nets, post padding, scoreboards and sports surfaces. SLVNBALS Aluline for netball / badminton. Combination with cap. 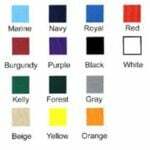 Suits synthetic floors. SLVNBALT Aluline straight sleeve for netball / badminton. Flanged top. Suits timber / outdoor floors. ACP-150 Access cover plate for indoor floors. Aluminium with lid and installation ring. Removal cover 138mm opening. 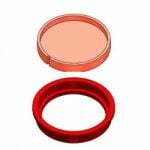 CAP-AL Drop in cap to suit Aluline series. (excludes tennis). 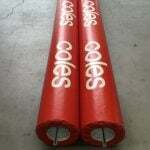 PPNBALC Netball post pad for NBAL post Cylindrical pad with RED vinyl cover. 2.9m high. 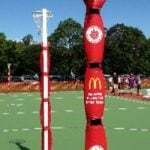 PPNBES Netball wrap around pads 2400mm high – Suits NBAL and VBES posts. 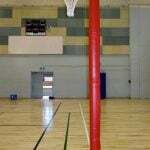 PPNBALH Netball post pad to suit Aluline Height Adjust system 2m in height.